With Valentine's Day just around the corner – roses are on many people's mind. Cut roses are the perfect gift on Valentine's Day and other special occasions. Rose plants are also attractive additions to the home landscape. A part of the rose plant that is often overlooked is the fruit or hips. While we try to avoid big hips on our bodies, big hips on a rose can be incredibly attractive. Rose hips mature in late summer or early fall and can be burgundy, scarlet-red, orange, or golden-yellow. In addition to being ornamental, rose hips attract wildlife to the garden. Many birds and small animals will consume hips during the fall and into winter, if available. Rose hips are edible for people too. They tend to be high in Vitamin C and are can be made into jams or jellies (with an equal part of sugar since they are quite tart). 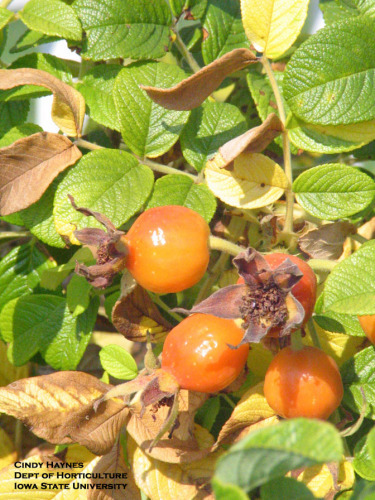 Rose hips are also sometimes dried and incorporated into teas. In fact, during World War II when Great Britain found it difficult to import citrus, a syrup was made from rose hips and used as an excellent substitute source of Vitamin C.
The tastiest rose hips come from shrub roses and old garden roses. Most shrub and old garden roses produce only one flush of bloom during the growing season. Deadheading (removal of spent flowers) is not necessary. In contrast, modern roses (hybrid tea, floribunda, and grandiflora cultivars) are repeat blooming and must be deadheaded to encourage continuous bloom. The hips on most modern roses are not as large or showy as those on shrub and old garden roses. Attractive, tasty hips are produced by many of the rugosa roses (Rosa rugosa) such as 'Alba', 'Frau Dagmar Hastrup', and 'Scabrosa', the sweetbrier rose (Rosa rubrifolia), and many other shrub and old garden roses. Other cultivars noted for attractive hips include, 'Adelaide Hoodless', 'Champlain', 'Henry Kelsey', 'Jens Munk', and 'Morden Centennial'. The Chicago Botanic garden rated these cultivars highly for attractive orange to scarlet showy fruit. (See Chicago Botanic Garden Plant Evaluation Note # 11 for more information on the shrub rose evaluation). Consider adding shrub or old garden roses with ornamental (and edible) hips to your garden this spring. Maybe you can give your sweetheart a gift certificate for one for Valentine's Day for one of these shrub roses. Just be careful...no jokes about hip size or you might be in for a lonely Valentine's Day celebration! Links to this article are strongly encouraged, and this article may be republished without further permission if published as written and if credit is given to the author, Horticulture and Home Pest News, and Iowa State University Extension and Outreach. If this article is to be used in any other manner, permission from the author is required. This article was originally published on February 3, 2010. The information contained within may not be the most current and accurate depending on when it is accessed.